1. Homes for Sale: Users can view current homes that are for sale by city. 2. Resources: Links are displayed to give users other helpful sites. 3. Gallery: Users can view multiple photos of completed homes. 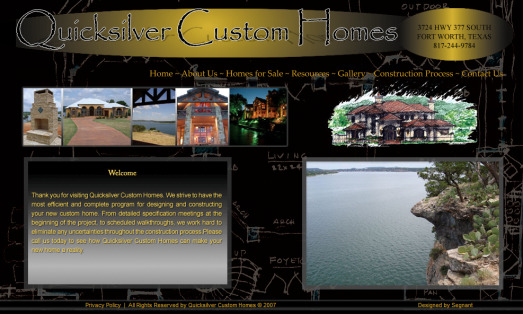 Segnant made the Quicksilver's design come to life and beyond with the site layout and functionality. The admin can easily maintain the Homes for Sale and Gallery sections so the site remains up-to-date.